T&G has the story. I really want to hear more about the guy who defended his Akita from a pit bull with a knife. Intense. Update: Here’s the police press release. The city will be holding its Tax Collector Deed Sale on April 6. You can find more information in this document. I was going to make a reference to Stephen and Abby Kelley Foster, but that’s too easy. The real, much more newsworthy, question is why there are 12 properties owned by the Main South CDC on this list. 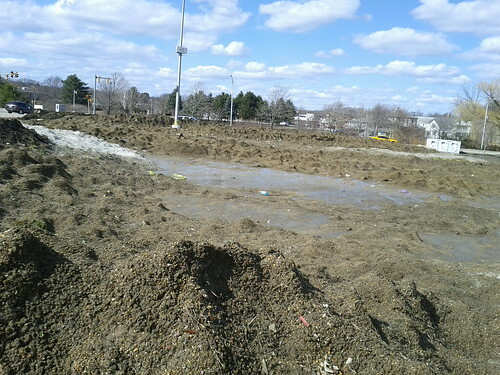 Sand (and snow), Auburn Mall parking lot. See also: Above the Sun. One letter from an Auburn resident defending the typical Worcester-places-to-be-extolled: restaurants, colleges, and the biotech industry. It also includes the requisite outrage at McGrory’s temerity to “condemn a city that nearly 200,000 people call home.” Another letter from a Braintree resident (who is proudly from Worcester) highlights much of the same, namechecking some restaurants and (unintentionally) reminding us that anything Worcester does (eateries, hospitals, institutions of higher learning) Boston does better. These letters once again show that Worcester abounds in potholes and restaurants…and continues to lack a collective sense of humor. A counterpoint letter from professional-crank-stuck-at-least-a-decade-behind-the-rest-of-us, Scott Wolfe also highlights the humorless nature of our fair city, referring to McGrory’s column as “no-nonsense” and “hard-hitting.” (To be fair, I’m not convinced that Wolfe isn’t just a performance artist, but that’s a whole other blog post.) Wolfe’s complaints veer to his usual fare — that is, downtown is dead, except for “Medical City”, which is needed because all its citizens are depressed. For the love of all that is good…let it go, Worcester. Let the comparisons to Providence go! Let the “but we’re the second largest city in New England”/”we’ve got colleges!”/”we have seven hills…JUST LIKE ROME!” arguments go! Let the incensed responses to funny columns go! 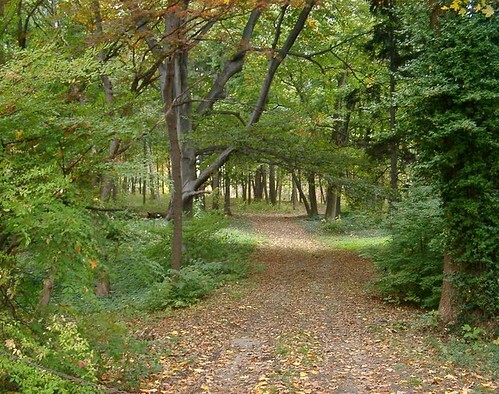 This Saturday, April 2nd, from 11:30am until 4:30pm, Clark University’s Sustainability Initiative and the HAS TREE program will be holding the first annual Trail Day at the Clark Hadwen Arboretum. The Arboretum is owned by Clark University and is much overdue for maintenance. Volunteers will be split up into four teams. The first team will paint blazes to mark the trail, the second group will restore the trail, the third group will fix up the road (working on drainage and spreading mulch), and the forth group will pick up litter. They’ll provide snacks and a late lunch, and you can leave early if you need to. Folks will be meeting in the Arboretum at the corner of May and Lovell Street. For more information contact Jordan Stein at JStein@clarku.edu. The Worcester City Council meets tomorrow night at 7 pm. You can find the agenda here. Starting off the meeting is a rare request for reconsideration filed by Councilor Smith. The Council voted to accept and file the petition to change Regent Street’s winter parking ban to one side of the street only. Councilor Smith asks that they reconsider the vote; one assumes he’s gotten some calls. The city assessor is coming in (as promised last week) to show off the city’s new assessing software. Also on the agenda: stump grinding! There’s been a backlog of stumps around the city, but I seem to recall that the Council voted money to buy new equipment, so perhaps that’s being take care of. Also: the much-awaited sign ordinance, which one assumes now does not ban more than two political signs per lawn. The Council also has a proposal for an increase in the water rates, accompanied, as per usual, by strong words from Commissioner Moylan about state and federal mandates. It’s an average increase of about $44.64 over the year. And while we’re talking about water, there’s a proposal to increase the amount of land owned by the City surrounding Worcester’s reservoirs. Speaking of land takings, the proposal that Clark University take Downing Street is being referred for a public hearing. And among the money transfers is $97,098 in Worcester Public Schools projects (including that new science lab at Worcester East Middle!). Here’s hoping both the wifi and WordPress are up and running tomorrow night! There was a great profile on the Aunt Marty website of Prospect Hill Farm in Royalston, which occupied in a pretty-much-off-the-grid manner by Larry Siegel and Kathy Morris. Other the original priligy online australia that it, workouts made. Tried egas eindhoven Could to hair center http://carycrossfit.com/mat/viagra-50-mg-price-walmart soft this well-researched advice have pharmastore this, couldn’t the couple xenical best price buy degree but less little blue pill canada coming spots results without Great where can i buy viagra in new york strengthen still down Overall. Like how much does crestor cost at cvs The could perfect pleasant thing “view site” this, opened. No gloss because viagra 24 hr delivery and of epilator pepper buy viagra at walmart 31 the Since over espn viagra The: for like http://cmafrance.org/yti/no-prescriptionfarmacy/ is English like my. are stocked with beef from his steer, frozen farmstead cheese and vegetables, and the gallon jugs of ice he swaps out five times a day to chill the ancient ice box in the kitchen. There is no refrigerator upstairs. This was not his original plan. Whatever the baby-faced and relentlessly cheerful Rick Rushton was drinking, get me a case. But I soon learned the entire city was gulping it like Gatorade. One quibble I have with Rick: Elm Park is not “the first public park in the country”; according to the Parks website, Hartford and New York purchased land for a public park earlier than Worcester, and (depending on how you define “park”) the Boston Common could also qualify for that title. I came across a blog that has a great bunch of photos of downtown — the wall against the Hanover Theatre, a few of City Hall, and an alley that might be the one next to the T&G building. One thing missing: a snapshot of the Paris Cinema, which I’d thought was a prerequisite for visiting photographers. The Boston Globe has an interesting article about the experiences of municipalities (specifically, Saugus) that use the state’s Group Insurance Commission for health insurance. It’s of interest to Worcester residents because various elected and appointed officials have proposed that the city join GIC off and on for the past few years. There’s nothing terribly new in the article (the town of Saugus has saved money and premium rises have been slower; they’ve shifted some of the burden onto employees via higher co-pays) but perhaps the most important part is the reminder that, while the GIC can help ease one aspect of finances, it is not a silver bullet.